Wedding sunsets... so romantic, so colorful, so dramatic. 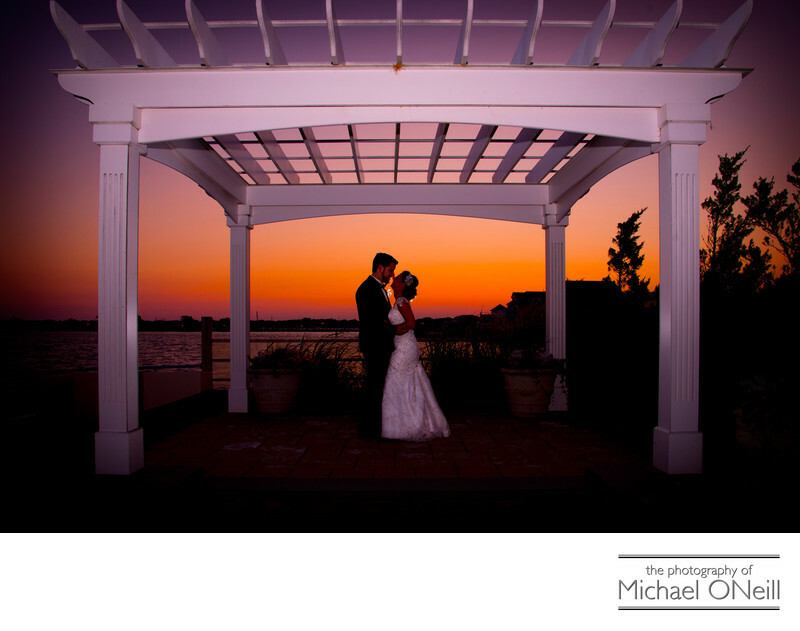 This particular wedding sunset picture was taken at Lombardi’s on the Bay, the incredible waterfront catering establishment located on the Great South Bay in Patchogue, NY. The stunning arbor/gazebo pictured here is the ideal spot for an outdoor wedding ceremony overlooking the water with Fire Island off in the distance. As evidenced here it also makes a beautiful spot for that perfect sunset photograph on your wedding day. I remember every detail of this couple’s wedding day. We spent time in the Village of Patchogue before arriving at Lombardi’s. Together with their bridal entourage of bridesmaids and groomsmen we strolled through the quaint village taking fun, candid, spontaneous wedding pictures before heading down to the water’s edge. At the foot of Ocean Avenue we stopped for a few more shots of the bride and groom and their wedding party; and their vintage limousine, on the municipal dock with the water in the background. The picture you’re looking at here came later still, when the sun had dipped below the horizon leaving the clear sky emblazoned in color. I am familiar with some of the best locations on Long Island for sunset photographa and would love to take you to one of them on your wedding day.